In the passing week, the market has entered a bearish setup upon taking out the Weekly Low of 6723.21. The Stop level is above 6928.25, whereas the target for this setup is the 6510 level, which is also a retracement of 38.2% of the bullish wave that has followed the Brexit decision. 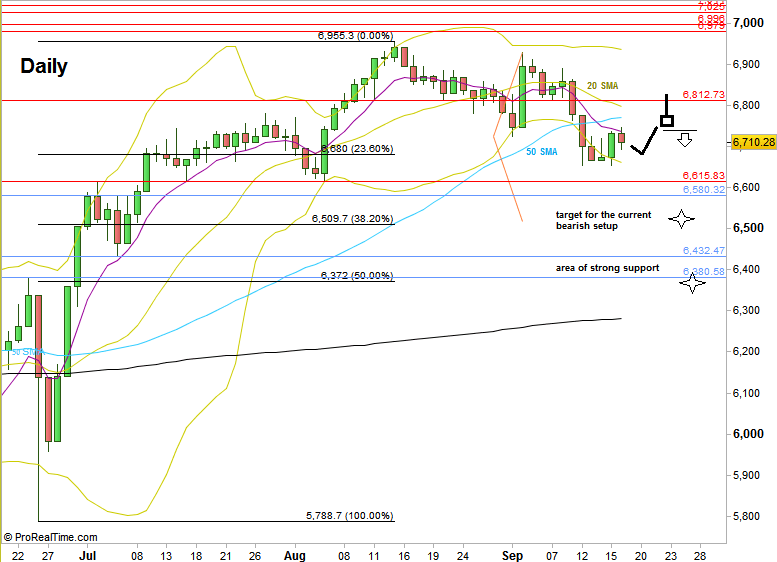 An extra bearish sentiment may put pressure on the price further down to the 6372 level, a 50% retracement. As expected, the area of 6650-6700 did serve as a support right on last Monday, and the market has spent most of the week testing the level and finally bouncing up. The current Daily correction behavior implies more attempts to get higher. A good signal to continue the current bearish setup might come from testing the Daily 20 and 50 SMA convergence (the shorter moving average crosses the longer one down), ending with a clear sign of weakness such as a Daily bearish pinbar or a bearish Engulfing pattern, both need to close below the lower moving average. The signal in this case would be to take a thrust down on the next Daily bar right after. It is advised not to compromise on the quality of this signal as there are very good chances to have consolidation for the whole coming week, while the next bearish continuation (if/when) might start only by the last week of September or even after. As for the bulls, currently this price action won’t be bullish before taking out the current Monthly High at 6955.34, where the stop would be the current Weekly Low (if not taken out by then) and the target is at the 7250 level. I would give this scenario currently much less chances to succeed. The Quarter is going to close within two weeks, and it is more likely to see the price consolidates in the current Monthly range rather than breaking up and closing the Quarter much more bullishly.